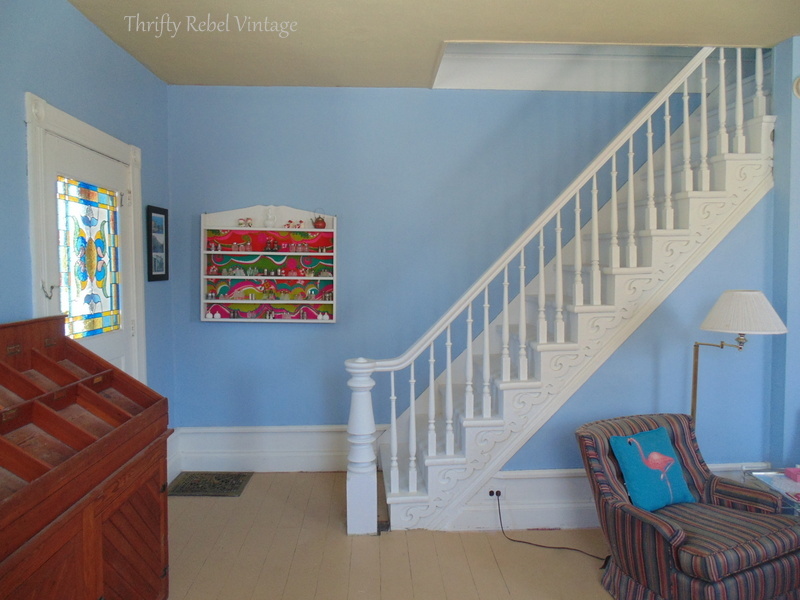 Decorating isn’t just about what colors you use, what projects you create, or what furniture pieces you find. Of course those things are all important. But for me it’s more about how a room makes you feel, and often about bringing back good memories. A few weeks ago I was thinking small with my pair of mini floral oil paintings, and they found a good home on a sweet narrow wall. And continuing on with my living room makeover, this past weekend I was thinking a little bit bigger. OK, a lot bigger. Like making a statement on a big wall kind of bigger. Here’s the before of the large living room wall beside the stairs to the second floor. Although I liked the the display shelf with my mini salt and pepper collection it seemed kind of small on that wall. Here’s that same wall after I painted the living room walls white, and added my JOY mirrors sign. I moved the shelf and the S&P collection to my craft room. And here’s what’s going on that wall. This is how I found the throw in a pile of blankets at the thrift store. I had no idea what is was, but the colors intrigued me. 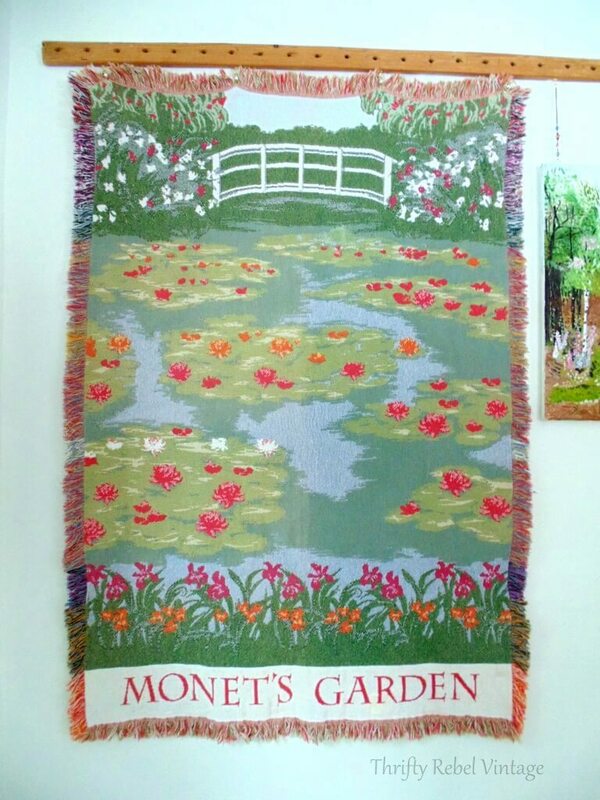 When I opened it up I was sooo happy to see that it was a throw blanket of Monet’s water lily gardens, and I immediately knew what I was going to do with it. It was way too pretty to be folded up most the time. Monkey seemed quite taken with it too. I think she was trying to smell the flowers. lol. John and I went to Paris for my 50th birthday in May of 2011. 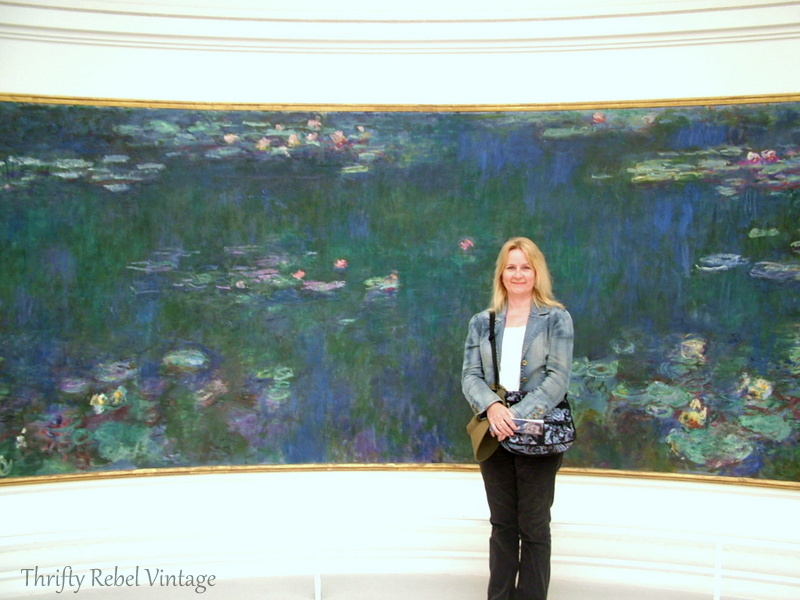 We didn’t make it to Monet’s home and gardens at Giverny, but we did visit the musee de l’Orangerieto to see his huge water lily murals. And they were pretty spectacular. Now there are some who think that you have to buy something on your actual vacation for it to be able to bring back the memories. That is so not the case with me. This throw definitely takes me back. So once I had this fabulous $5 throw I had to figure out a way to hang it. 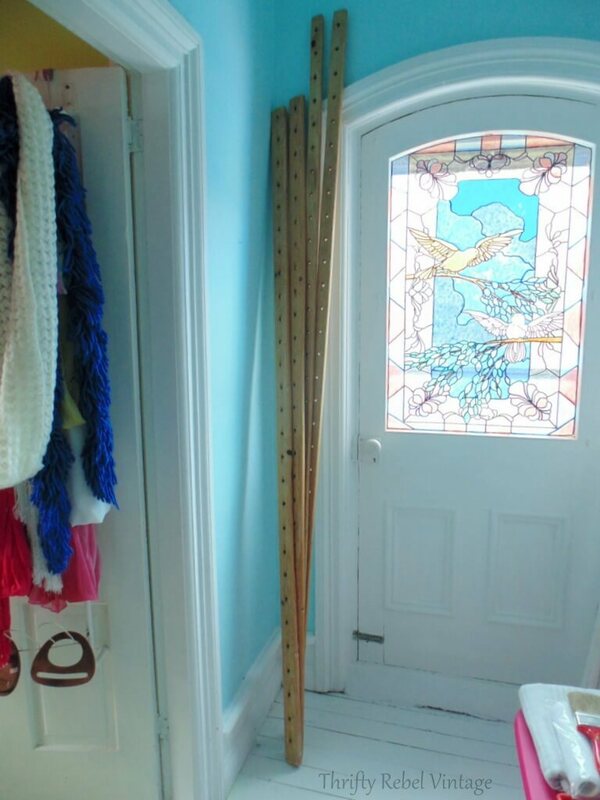 There are many things you could use; a traditional curtain rod, a piece of 1×2 lumber, a broom handle, plumbing pipe… and probably many other possibilities too. But luckily I had just the thing that has been waiting for a project. Enter something amazing that I’ve been hanging onto for a couple of years now. 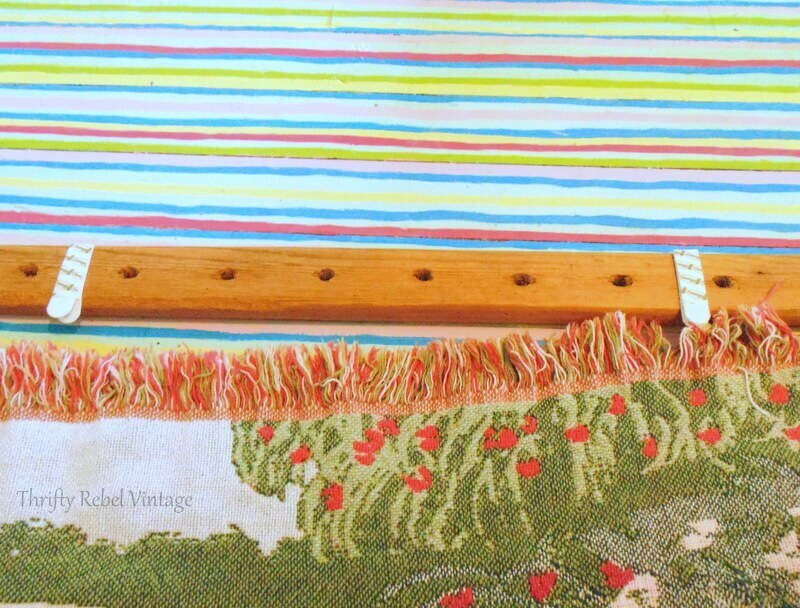 I found this vintage/antique (not sure how old it is) wooden quilt frame for $10. I had never seen anything like it before and I just had to have it. There are two seven foot pieces and two eight foot pieces, and four little corner pegs that didn’t make it into the pic because they’re somewhere in a safe place. lol. I already have plans for the other three boards for non-living room projects, but I’m waiting as always to find what I need to make those projects possible. 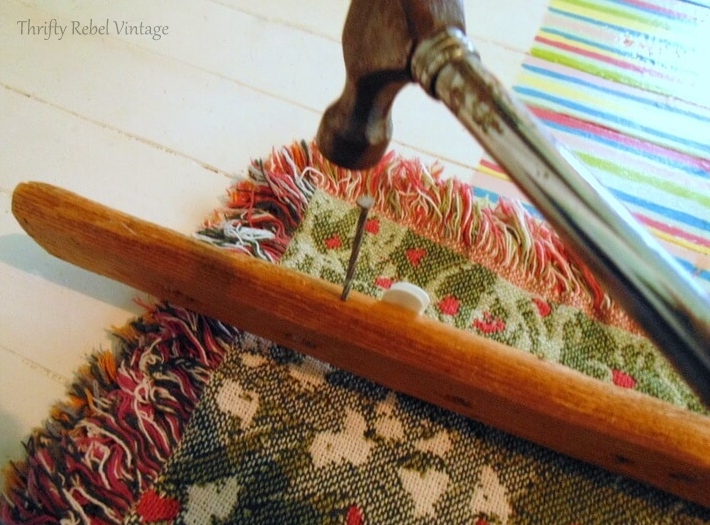 The pieces are very aged and worn, and I can only imagine how many fabulous quilts this frame helped to create. 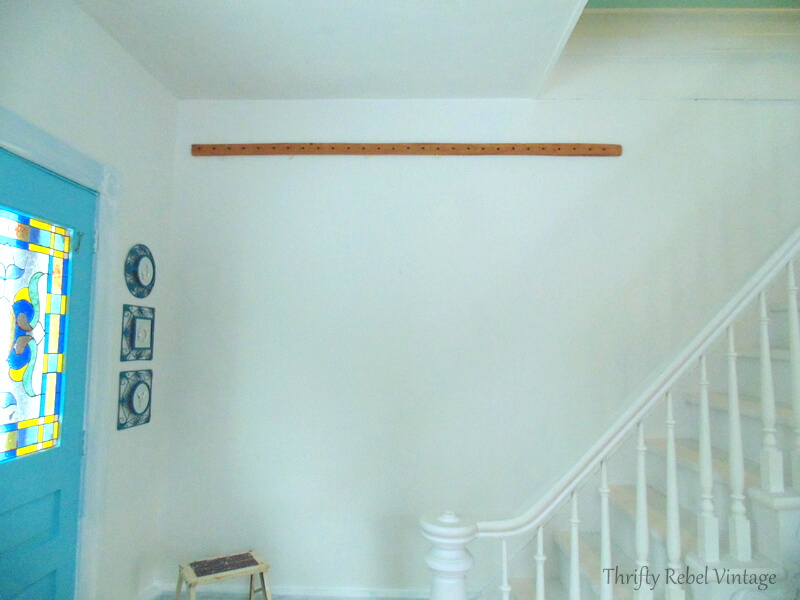 The seven foot boards are wider so I decided to use one of them to hang my throw on the wall. I started by attaching 4 Command velcro strips evenly spaced on the back of the board. Then I used a nail and hammer to add starter holes for some brass hooks. 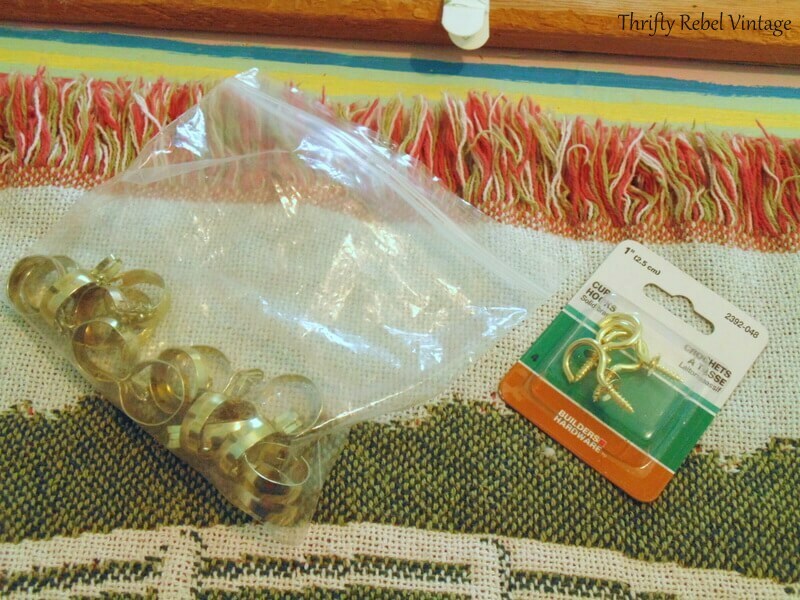 Here are the brass hooks and thrifted curtain clips that I’m using. I added four brass hooks evenly spaced across the bottom of the board. Here’s that blank wall again. I removed the adhesive from the back of the velcro strips and put the quilt frame board in place. Measuring down from the ceiling and and marking the wall in several places with pencil first helped me to easily get it straight. 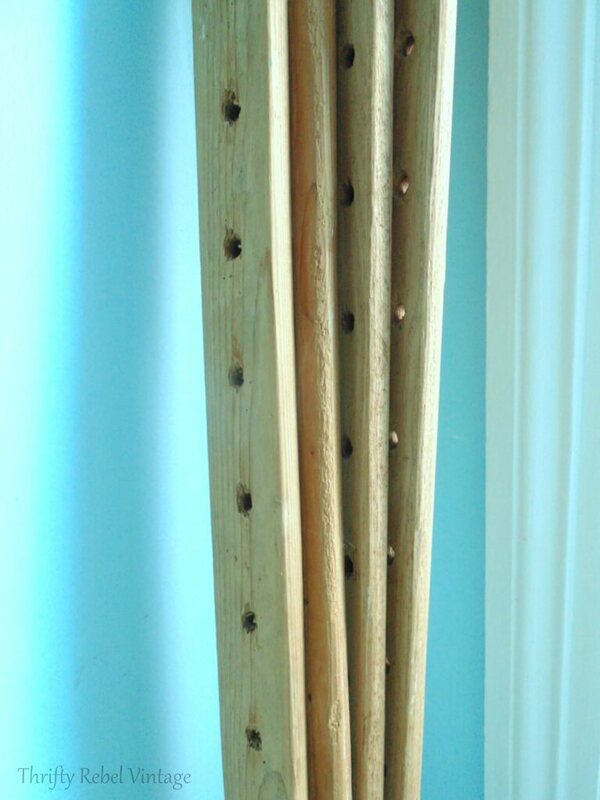 After the board was up I screwed a 4″ screw through four of the holes into the wall evenly spaced to give it full support. This way the board basically sits on them rather than screwing through the actual board, which I didn’t want to do. The screws aren’t visible unless you’re very close up and know where to look. The velcro strips were used just to hold the board in place so I could get those screws in. Then I just hung the throw using the curtain clips. The throw really does look like a piece of art. And if you’re really an impressionist lover, here’s the back. This amateur oil painting that I thrifted for $3 a few years ago looks fabulous beside the throw wall hanging. 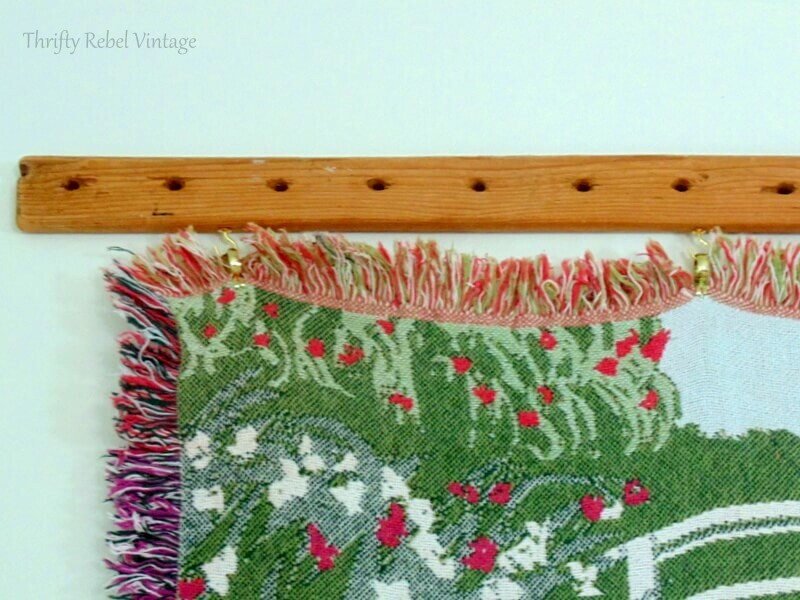 I hung it using slightly smaller brass hooks and two pieces from a vintage necklace. So here’s the wall’s before the before. 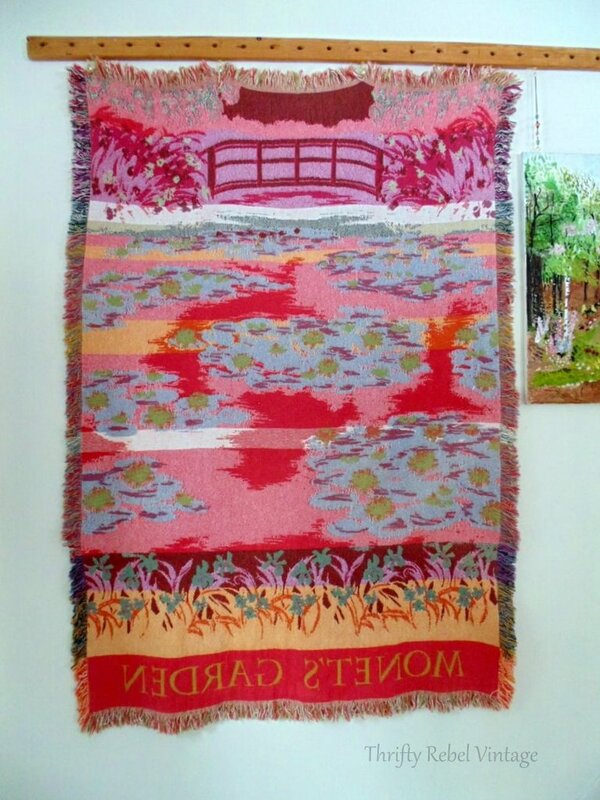 Now instead of just a throw blanket it’s a wall hanging piece of art, and one that will bring us a lot of joy. I put it at a height that is balanced by the windows on the other side of the room. 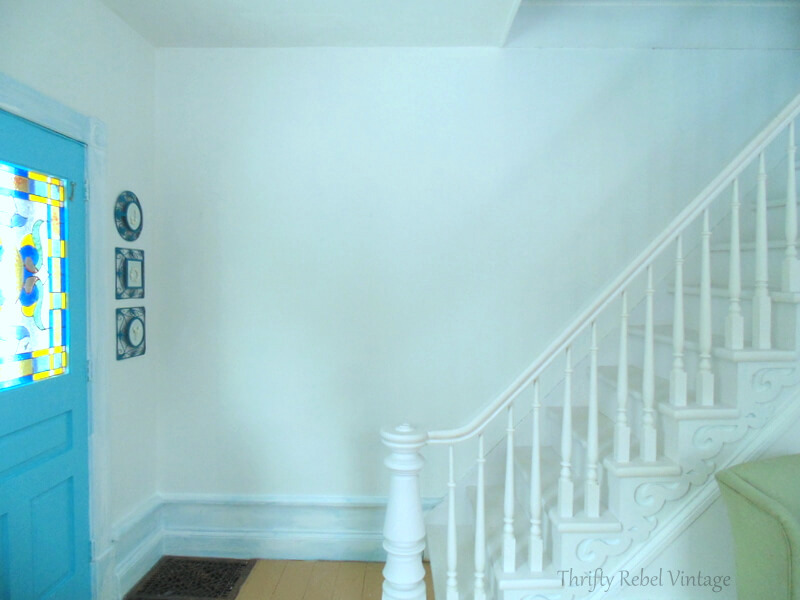 You’ll notice that I also gave the white trim another coat of paint, and in some places it still needs another one. Now I’m on the hunt for a few things for above, below, and beside the oil painting to finish this wall vignette. I do have a few ideas in mind. 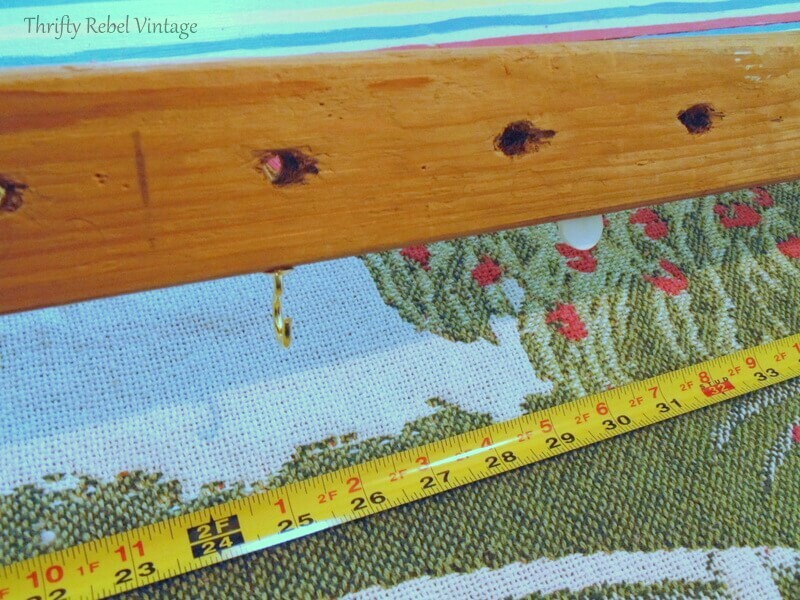 I also want to add three more brass hooks and curtain clips to the throw to give it more strength at the top. Four was all I had at home to work with. After I put this up I sat for over an hour sipping a cup of tea and just looking at it. So there I was in the present… remembering our past trip to Paris, and imagining our future trip too… hopefully for my 60th. Who says you can’t experience all three time tenses at the same time? lol. 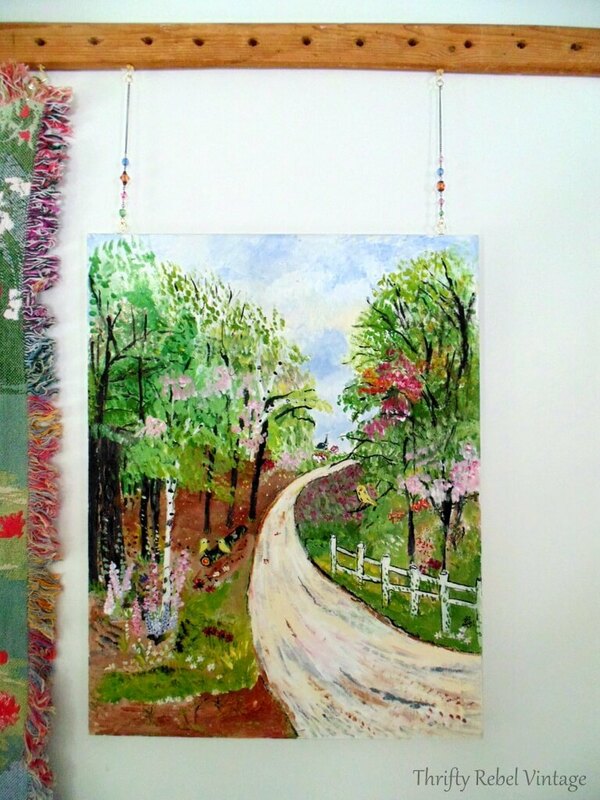 In my mind I imagine the road in the painting is in the countryside just outside of Paris, and it leads us to Monet’s home at Giverny. 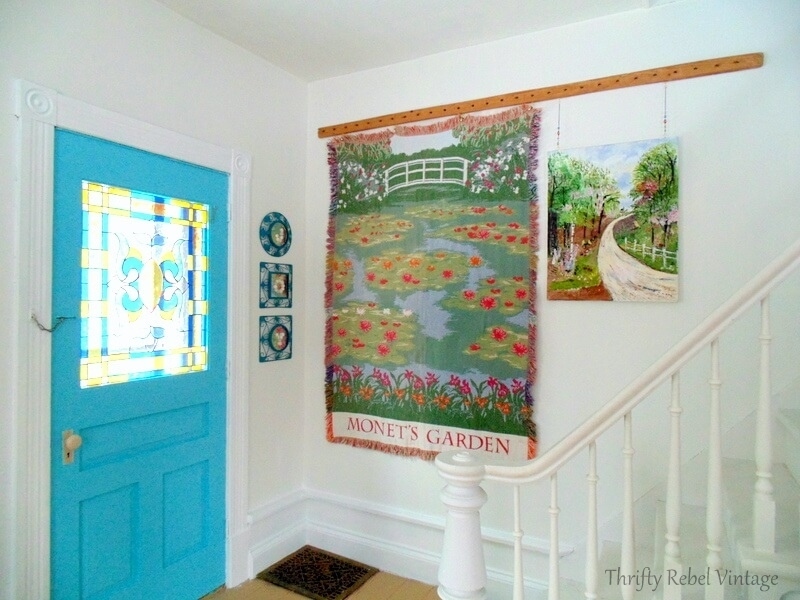 We tour his wonderfully colorful house, and stroll through the fabulous gardens. Then we’ll stand on the bridge overlooking the water lily ponds and the birds will serenade us with French birdsong. It’s a beautiful sunny day in May, and even though it’s not summer the water lilies will be blooming anyway… just for us. Anything can happen in a dream, and oh this girl can dream. And she’ll keep right on dreaming. How Beautiful and a wonderful memory keeper. I too have a huge frame but mine is lined with small nails. I think mine is a lace maker’s board. Love your idea and may have to do something with it. I love your creativity and the change to your room is just amazing. Thanks for sharing. Thanks very much Valerie! Your frame sounds very interesting. I’ve never seen a lace maker’s board. I love it Tuula! 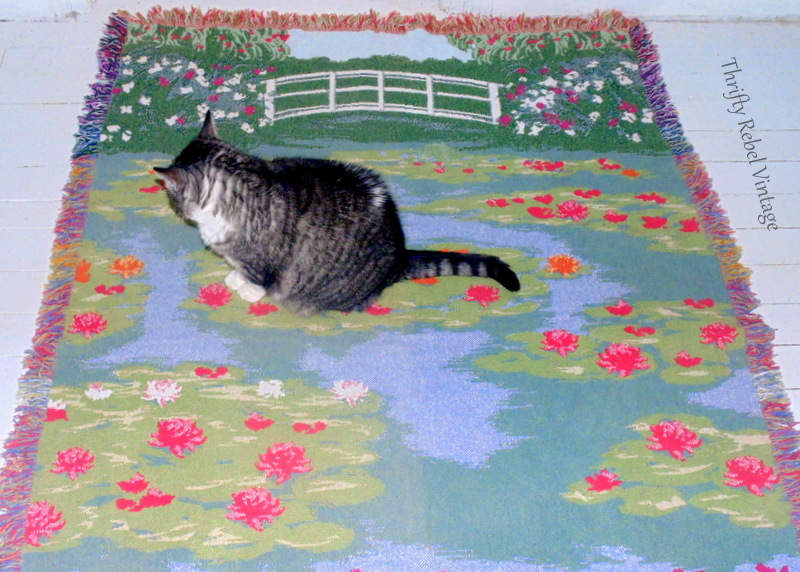 At first, I thought the cat was part of the print on the blanket, lol! I had to scroll back up after you said it was Monkey! lol! I love how you’ve chosen to hang it too, very nice! Thanks Tania! Monkey wants to be a part of everything. She’s my biggest helper. lol. 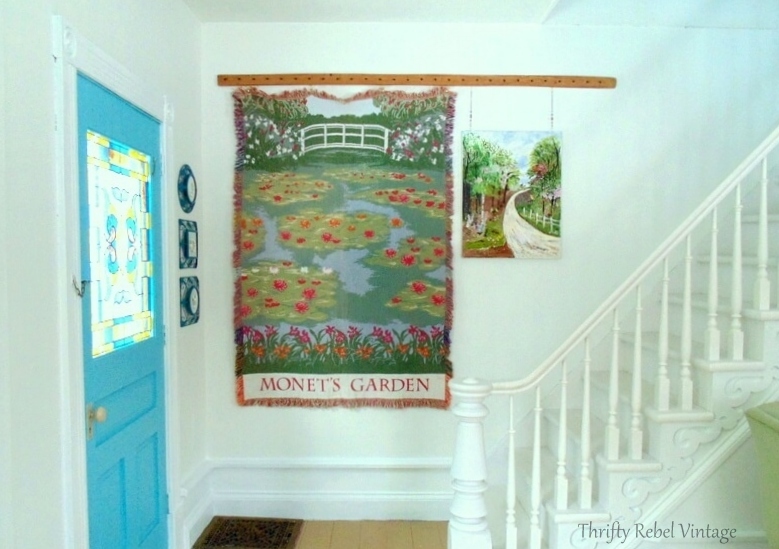 What a neat reuse of the frame. 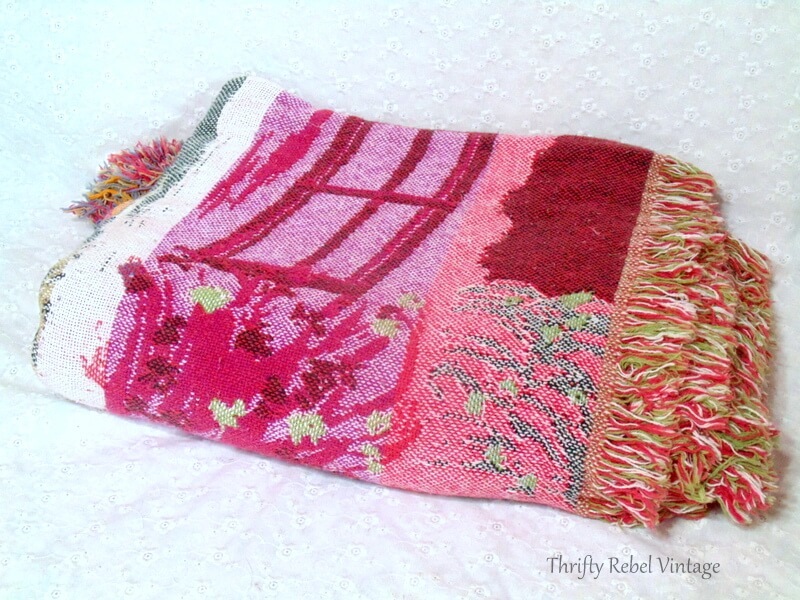 Love the throw, both sides! At first glance I thought monkey was actually part of the scene. You couldn’t walk passed it without feeling happier and more hopeful. Happy Tuesday! Thanks so much Mary! The throw and the frame are two of my favorite finds so I’m glad I could reuse them together. All 4 of our cats are project assistants, but Monkey is the most helpful. Or at least she thinks she is. lol. Thanks Dona! I have to admit that it’s usually my heart that directs me and I just hope that my eye can make it work. I’m so glad my project brought back some memories for you. How wonderful that your daughter is taking up quilting. It’s an art I truly appreciate. Happy Thanksgiving to you! 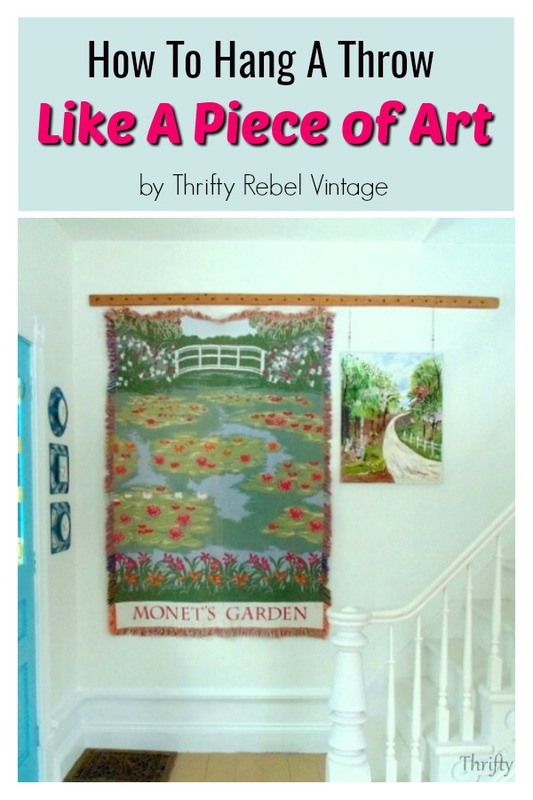 That looks soooo pretty there…and the painting hanging beside it is perfect! 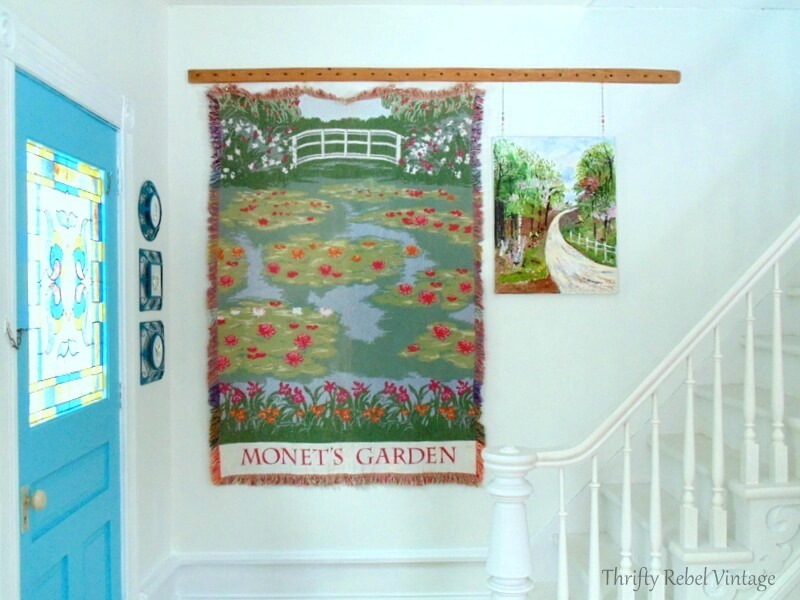 I love Monet, too…..his paintings are so peaceful and just staring at one can take some stress out of your day. Thanks for sharing and have a wonderful Thanksgiving!!!! Thanks so much Karolyn! 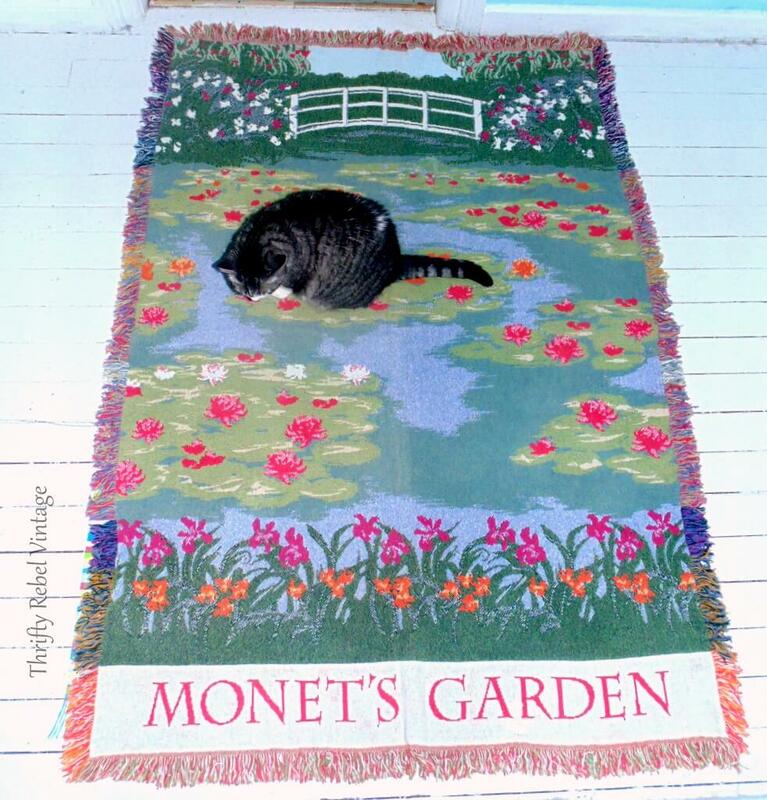 I totally agree with you about Monet. Happy Thanksgiving to you!